Build the foundation you need to understand the science of genetics and its growing role in the diagnosis and treatment of diseases and disorders. 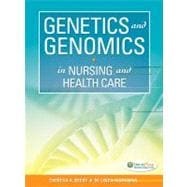 Two experts in the field present the biological, psychological, and social implications of genetic influences in health care in an easy-to-read and -understand style.Inside, you'll find the thorough coverage and clinical examples you need to understand the basis of genetic inheritance, the influence of somatic and germline mutations, the multifactorial relationship of gene-environment interactions, and the foundation of ethical behavior in providing comprehensive genetic nursing care. It's perfect for both stand-alone courses or integrated into courses across the curriculum.